Technology - she's the sweetest lady on earth, and one that always pops up in the coolest and most jaw-drooping ways as we head into our jet-pack promised future. 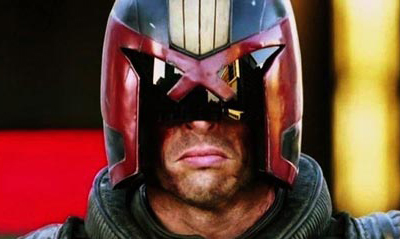 While it's a long time before we reach the state of Judge Dredd's hometown of Mega-City One, Lionsgate have released a motion poster for their upcoming adaptation Dredd, where Karl Urban as the title character actually declares judgement on you. Keep your sound on for this one folks! Okay, I'm going to admit I jumped when the motion hit, but give me a break. It's early morning and I still haven't had coffee. Hit refresh to see it all over again or click here to visit September 21st film's website judgementiscoming. Aren't choices great? Now that's what I call Marketing! Hell yeah!!!!!!! I know right?! Plus what the Avengers could've used it for. Imagine a poster with Cap yelling 'Avengers Assemble' and the others falling in behind him! Mind you, he didn't yell it in the movie so maybe it's best to leave it for the sequel!